Marguerite (“Peggy”) Ryan is one of many illustrious winemakers trained by Warren Winierski at Stag’s Leap Wine Cellars. She is a law school graduate who moved to California, enrolled in enology classes and began her career at Stag’s Leap as a lab technician. 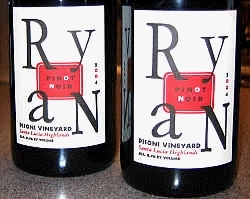 She started her own label in 1996 releasing 70 cases of Pinot Noir and has subsequently sourced grapes from several prestigious vineyards like Pisoni and Garys’ in Santa Lucia Highlands. Limited retail distribution.